RSVP: Please RSVP to David Cutler by Tuesday, February 17. Operation Protective Edge, launched by Israel in July 2014, raised serious questions about adherence to human rights standards and violations of international humanitarian law. As the conflict progressed, PHR-Israel commissioned a fact-finding mission by eight independent international medical experts, including Dr. Leaning. Aided by reputable Gaza-based human rights and medical organizations, the mission was the only independent international body granted permission from Israeli authorities to enter Gaza during the war. 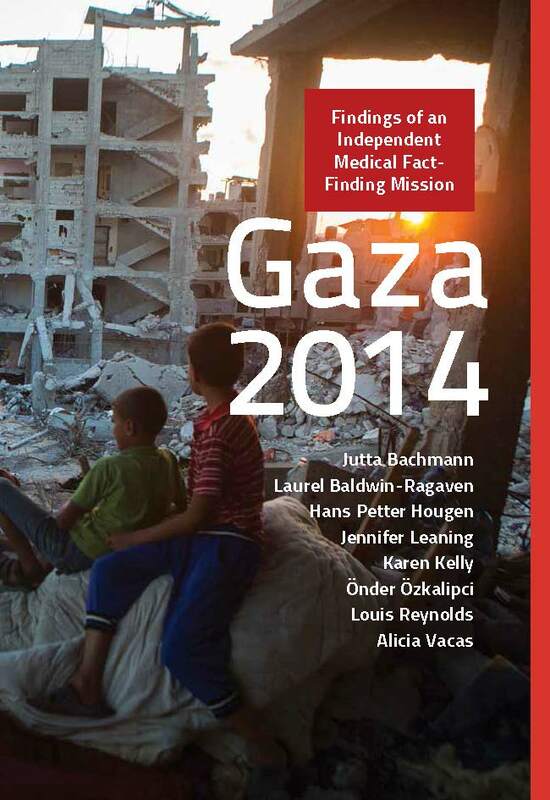 Its main findings are compiled in: “No Safe Place – Findings of an Independent Medical Fact-Finding Mission – Gaza 2014“. The report is based on testimonies from people injured in Gaza, analysis of photos, interviews with Palestinian medical professionals, and review of dozens of medical files. The delegation conducted three visits to Gaza and its members also met Israeli doctors who provided medical care to soldiers and residents of Southern Israel during the fighting. Physicians for Human Rights-Israel (PHR-Israel) is a non-profit, independent non-governmental organization that promotes equal application of the right to health in Israel and the occupied Palestinian territories. PHR-Israel’s focus on the right to health encompasses prerequisite conditions for health, such as freedom of movement, access to essential medical services, clean water, sanitation, nutrition, housing, education and employment opportunities. PHR-Israel supports efforts by members of the Israeli medical community to address human rights violations, including torture, and supports active implementation of the right to health in accord with international human rights treaties and principles of medical ethics. More than half of PHR-Israel’s 1500 members are medical professionals. Physicians for Human Rights-Israel is distinct from the US-based organization Physicians for Human Rights. Both organizations are members of the Steering Committee of the Safeguarding Health in Conflict Coalition and have partnered on other advocacy initiatives. Ran Goldstein is Executive Director of Physicians for Human Rights-Israel. He formerly served as Head of Communications for the ICRC Delegation to Israel and the Occupied Territories. He has also held positions as the Senior Strategy and Communications Consultant to various Israeli Civil Society Organizations and worked as a journalist for a number of leading Israeli media outlets. Goldstien is a Founder and board member of a newly established Israeli NGO – “Akevot” – Institute for Israeli –Palestinian Conflict Research. Jennifer Leaning has been Director of the Francois-Xavier Bagnoud (FXB) Center for Health and Human Rights since 2010. An expert in public health rights-based responses to humanitarian crises, Dr. Leaning is the FXB Professor of the Practice of Health and Human Rights at Harvard School of Public Health and Associate Professor of Medicine at Harvard Medical School. Prior to her current appointment, Dr. Leaning served as Co-Director of the Harvard Humanitarian Initiative. From 1999 to 2005, Dr. Leaning directed the Program on Humanitarian Crises and Human Rights at the FXB Center, during which time she also served as Editor-in-Chief of Medicine & Global Survival, an international quarterly. Dr. Leaning serves on the boards of the Humane Society of the United States, and the Massachusetts Bay Chapter of the American Red Cross. She formerly served on the boards of Physicians for Human Rights, Physicians for Social Responsibility, and Oxfam America. She is on the faculty of HSPH’s Department of Global Health and Population, and teaches disaster management, human rights, and public health and policy response to humanitarian crises. Dr. Leaning has documented human rights abuses and provided medical care and public health services on the ground to refugees, including humanitarian emergencies in Afghanistan, Albania, Kosovo, Angola, Darfur, the Middle East, the former Soviet Union, Somalia, and the African Great Lakes region. One of the first to identify the conflict in Darfur as genocide after extensive field investigations, Dr. Leaning testified before the International Criminal Court in the Hague, the United States Congress, and the United Nations on the plight of women in humanitarian crises, particularly in the case of Darfur.